Three years ago, when Microsoft (MSFT) announced Satya Nadella would succeed Steve Ballmer as CEO, the announcement was met with subdued enthusiasm from Wall Street. While Nadella, previously in charge of Microsoft's server software and cloud services, was considered a capable exec, many investors were hoping former Ford CEO Alan Mulally would be the pick, out of a belief that Mulally would be more willing to shed unprofitable businesses and carry out other shareholder-friendly moves. With Microsoft's stock up about 75% since Nadella's appointment, his support among investors is definitely stronger than it was in early 2014. Here, it hasn't hurt that, while not as aggressive in his shareholder-focused actions as Mulally may have been, Nadella has done things like conduct layoffs, significantly lower Microsoft's phone exposure and sign off on fresh stock buybacks. [post_ads]But from a long-term perspective, what arguably matters more is how much Microsoft's product execution appears to have improved under Nadella and the overhauled management team reporting to him. This improved execution has already had a top-line impact, as Microsoft's last few earnings reports show. And as the hardware and software just revealed by the company show, the ripple effects are far from over. At a Tuesday event held in New York City, Microsoft unveiled Windows 10 S, a low-cost version of Windows that's meant for the education market and only runs Windows Store apps, along with its 13.5-inch Surface Laptop. It also showed off a smattering of education-focused software products, perhaps the most notable of which is a classroom-friendly version of Microsoft's Teams collaboration app (a rival to the fast-growing Slack). The software giant promises Windows 10 S will ship on laptops costing as little as $189 this summer, and come with a free subscription to Minecraft: Education Edition. The company is also bundling a free subscription to Office 365 for Education, but it's worth noting this version of Microsoft's productivity suite only features online apps. 10 S systems will be upgradable to Windows 10 Pro, reportedly for $50. Supporting only Windows Store apps makes it much easier for schools to manage and secure devices, while providing everyone else a big incentive to continue paying for Windows 10 Pro licenses. In addition, Microsoft claims Windows 10 S enables faster logins than Windows 10 Pro -- important for less powerful hardware -- and lets users set up systems with preconfigured USB drives. One major downside to the OS: Alphabet/Google (GOOGL) hasn't made Google Chrome, or for that matter any of its other Windows apps, available through the Windows Store. And with Windows 10 S aimed squarely at Google's Chrome OS and the low-cost Chromebooks running it, Google has good reason to keep things the way they are. The 10 S launch follows massive education-market share gains for Chrome OS, especially in the U.S. Research firm FutureSource Consulting estimates Chromebooks accounted for 58% of U.S. K-12 notebook/tablet shipments in 2016, and Windows notebooks just 22%. Internationally, Windows had a 65% share, and Chromebooks a 17% share. If a school feels it can forego Google Chrome and make do with Microsoft's Edge browser, Windows 10 S looks like a compelling alternative to Chrome OS, particularly given Windows' large PC app ecosystem and the fact that the Windows Store will soon support the full PC version of Microsoft Office. On the other hand, those schools that are willing to forego the PC version of Office and/or want to deploy notebooks that can double as tablets might still prefer Chrome OS, which is licensed for free and has begun supporting Android apps. 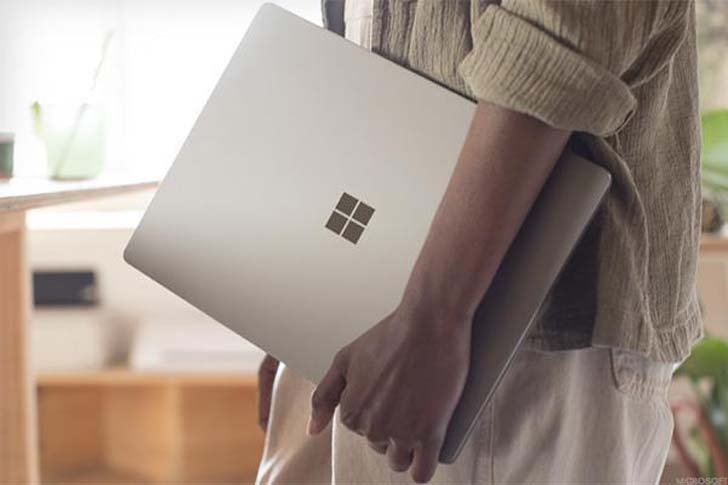 While Windows 10 S targets a Google product, the Surface Laptop takes aim at Apple's (AAPL) MacBook line, along with premium Windows laptops from the likes of HP Inc (HPQ) , Dell and Lenovo. In a product reveal that would make Jony Ive proud (well, maybe), Microsoft touted the Surface Laptop's lack of visible hinges and seams, a fabric-covered keyboard relying on a microfiber called Alcantara and what the company claims is the thinnest LCD touch module in existence. Though the device weighs just 2.76 pounds, features a high-resolution touchscreen and runs powerful Intel (INTC) Core i5 and i7 CPUs based on the chip giant's Kaby Lake architecture, Microsoft promises 14.5 hours of battery life under normal use. This is made possible by the company's efforts to partner with Intel to do things like shrink the size of the Surface Laptop's motherboard (thus providing room for a larger battery), and to put its solid-state drive (SSD) directly on the motherboard using a high-speed PCIe connection. [post_ads]With a starting price of $999, the Surface Laptop is markedly cheaper than Microsoft's Surface Book (launched in late 2015), which features a detachable touchscreen and starts at $1,499. And that makes the product well-suited to target users of Apple's MacBook Air notebooks, a product line is future is now very much a question mark. Though Apple refreshed its high-end MacBook Pro line with three new models -- including two with OLED touch strips -- last October, it didn't update a MacBook Air line last refreshed in early 2015, and discontinued its cheapest Air model, an 11-inch device that started at $899. The cheapest MacBook Pro sporting a touch strip starts at $1,799, while the one lacking a touch strip starts at $1,499. Excluding its 13-inch MacBook Airs, which start at $999, Apple's cheapest notebook is its retina MacBook, which starts at $1,299, has a relatively small 12-inch display and relies on only one USB Type C port for both power and connectivity. That gives the Surface Laptop an opening to win over some MacBook Air users, should they be willing to consider a Windows system (certainly a big qualifier). It also more broadly puts Microsoft on better footing in a premium notebook market that has been a strong point for the PC industry. At the same time, Microsoft still badly needs to refresh its Surface Pro tablet/convertible line. The fact that the last Pro line was last updated in the fall of 2015 was a big reason why Microsoft's total Surface revenue fell 26% annually in the March quarter to $831 million. A Surface Pro 5 featuring Intel Kaby Lake CPUs and other incremental improvements is rumored to be in the pipeline. Overall, though, Microsoft's Tuesday event showed a level of focus and execution that was often lacking during the Ballmer era, particularly when it came to consumer-facing products. The company rolled out two products that clearly took aim at popular offerings from other tech giants, with each offering showing a good understanding of what the customers it primarily targets are looking for. This kind of execution is also evident in a number of other Microsoft products launched over the last two years. One can see it Windows 10, which fixed much of what was wrong with Windows 8 and has been steadily updated with new features, and in the slew of value-added apps and services Microsoft has launched for Office 365, helping the Office franchise expand its addressable market and fend off Google's G Suite. In the data center, one can also see this execution in the numerous services launched for Microsoft Azure, helping it become a strong #2 player in the cloud infrastructure market behind Amazon Web Services. Or in the improvements delivered for a less flashy product such as the SQL Server database, helping it take share from the likes of Oracle (ORCL) and IBM (IBM) . Microsoft's total server products and cloud services revenue (not counting Office and Dynamics cloud apps) rose 15% last quarter, a much better clip than what many peers can claim. All these product launches and improvements won't make Microsoft a high-growth company. It's far too exposed to slow-growing franchises such as Windows, Office and Windows Server for that. But they have made Microsoft's growth outlook look far better than it did towards the end of the Ballmer era, when predictions of its gradual slide into irrelevance could be found by the dozens.